If you have ever needed the Annual Cures in place more, April is definitely the time. We have a lot of inauspicious Flying Stars grouped in different sectors this month and the Annual Cures are needed to settle the menacing influence that this can bring. That being said, we also have auspicious Stars paired together which the Cures and Enhancers can really help to activate the positive influences. With the Annual #2 Flying Star and the visiting monthly #9 Flying Star in the centre in April, this produces fire feeding earth and can cause a lot of problems with the effects of the #2 Annual Star so please be sure to read below to make this a positive month in your home or office. This area can also be very good for relationships this month and to enhance you should introduce some metal elements that are round in shape, a traditional enhancer and cure is a brass wu Lou or any object that is round in shape and made from a good quality metal like brass copper, steel. Avoid having large quartz crystals (over 4 inches in size) in this area this month however, if the flying star general advice suggests you to place quartz crystals this is more important to follow. If you activate this area of the home this month it can bring in new opportunities, gains in financial investments, academic achievements and also romance and relationships as peach blossom is very good here. The intensity of these characteristics will differ in varying degrees according to the influence of the land formations around your home and something this software is obviously unable to analyse. Stillness together with metal cures can keep its negative influences at bay and you must avoid using fire energy like reds and candles in this area this month. You should place a Wu Lou and six Chinese coins tied with red ribbon and also place more metal decorative objects (provided they are not menacing looking, round shape metal is good) to dissipate its negative influence. To remedy its effects use red decorative objects, candles, lamps and lights. A nice simple cure is a red, pink, purple, burgundy (fire colour) floor mat or a table lamp with a red shade. Do not use metal (metal colour is ok) to control this energy. This is a good area in general especially for those in studies although the Annual #2 star can still bring problems to the centre.. If this is a family area (living, dining or a library), discourage children to study here. 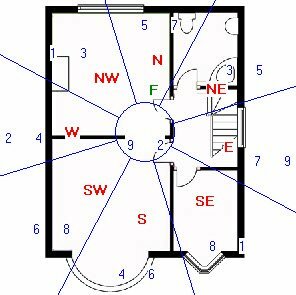 Couples with a bedroom in this location should take a look at the Annual Flying Star advice to weaken this area.